Canadian cannabis border issues. 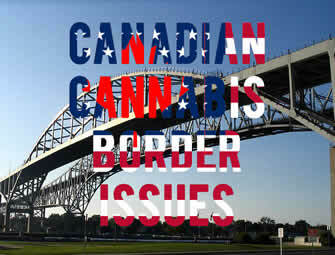 Canadians who work or invest in the cannabis industry, or use it are facing life bans at US border crossings. With Canada set to legalise cannabis on October 17, Customs and Border Protection (CBP) warning people it will not allow them into the US. CBP executive assistant commissioner for field operations Todd Owen said the US will not change is policies to accommodate the changing Canadian laws. Under Federal US law, cannabis is still illegal across the country although it is legal in some US states. Canada’s cannabis industry predicts it will generate billions in the next few years. Canadians are lining up to work and invest in the industry as the laws are about to change. But, this can get them into trouble when trying to cross the border into the US. This is even though their activities are legal in Canada. The CBP intends to treat Canadians involved in cannabis as trafficking in the drug. Owen echoes the rumours that have been flying around over the last year. Venture capitalist and chief executive of a British Columbian agriculture machinery company, Sam Znaimer already has a lifetime ban on entering the US. Border control officers will not ask everyone crossing the border about cannabis. But, if other questions lead in that direction or they can smell cannabis in a vehicle, travellers will need to explain. The same if drug detection dogs indicate travellers are carrying weed. Owen said lying about weed involvement could get people into trouble. Lying is a misrepresentation and fraud, which carries a lifetime ban from the country. When people admit to using illegal drugs, they cannot enter the country. They will have the option to leave the border voluntarily or officers will remove them. And, the CBP will keep a record of travellers who cannot return to the US for pot issues. They can apply for a waiver to return, but this costs $585 and takes several months to process. CBP officers usually ask people what they do for work. Those who say they work in the pot industry will not receive permission to enter. This is the same for people investing in the industry as the US does not recognise this as a legitimate business. But, there is no clarity about how much stock someone can have in a cannabis company for refusal into the US. This makes it tough for people such as truck drivers whose income relies on being able to cross the border as part of their work. And for Canadian nurses working across the border who are a part of trusted traveller programs such as NEXUS. If these people admit to using cannabis they will lose access to these programs. Anyone found in possession of pot at the border will face prosecution or fined $5000 by the CBP. The CBP has the discretion to let first time offenders off with a $500 fine. But this lenience depends on each person’s circumstances. Canadian Drug Policy Coalition senior policy analyst Scott Bernstein said investing cannabis will be legal. The lack of clarity about the level of investment a person has in the cannabis for entry denial is a concern. Many Canadians have shares in public cannabis companies that trade on the Toronto Stock Exchange. Bernstein said thousands of Canadians are investing in a legal industry. Some people who have a mutual fund may not even know they are investing in the cannabis industry. Bernstein does know if these types of investments will affect them crossing the US border. He is also concerned the US is stereotyping people using cannabis. He thinks the Canadian Government should talk with the US so people working and investing in the cannabis industry can enter the US. Canadian Prime Minister Justin Trudeau had said his government does not have the right to interfere with US policies for admission into the country. He said all countries had the right to decide who entered their country. Though he said they were working with the US to ensure travel between Canada and the US is not disrupted. Cannabis was already legal is nine US states, yet the US federal government has made no move to legalise cannabis. US Attorney General Jeff Sessions wants the federal government to crack down on cannabis. While people traveling between Canada and the US can refuse to answer questions at the border, refusal can imply guilt of some sort. This can see them refused entry on the spot and a lifetime ban from the US. With Canadians making more than 42 million Canadians making daily or overnight trips across the US border, Canadas changing laws could cause border problems for the US. With the CBP paying closer attention to travellers at the border it could cause long delays at border crossings. This remains an unknown until Canada’s new cannabis laws come into effect.